Real food on a budget. It’s no secret that our grocery budget is $330/month for my family of four. Everyone always wants to know, “HOW?!”. There was a time when I felt like no matter what I did, nothing worked. I was frustrated with our budget. We needed to save money, but not eating wasn’t an option (especially with a baby on the way). I relied on relied on boxed and pre-packaged foods because I thought they were cheaper. We had to cut spending somewhere, and that seemed like the most logical place. I was overwhelmed, discouraged and felt hopeless. A baby was coming and our income was about to be cut in half! I had to do something, but nothing I did worked anyway. What was the point? Maybe you are in a similar situation? Being able to afford healthy food shouldn’t be difficult, but there are a ton of seemingly impossible hurdles to overcome. 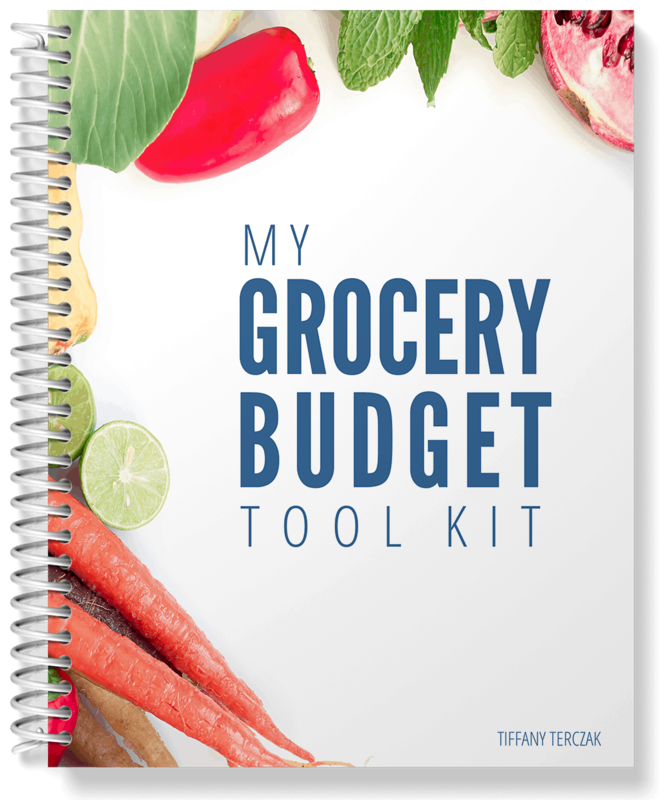 My Grocery Budget Toolkit helps you overcome those obstacles so you can focus on putting healthy food on the table night after night, without going broke. Years ago my husband and I were in a tremendous amount of debt, thanks to several poor decisions I made. I was never taught how to budget and my efforts made me feel like a failure. I WANTED to save money, but I didn’t know where to begin and I needed help. With a new baby on the way and our income about to be cut in half, my husband and I took a good hard look at the one line in our budget that could be reduced: food. We scratched some ideas down on paper and made a decision that forever changed the trajectory of our lives. It’s hard to believe that a few pieces of paper can have that great of an impact on your life, but it’s true. Those worksheets helped us pay off ALL of our debt. They helped us cut down in other areas of our household budget too and rapidly build an emergency fund. With no debt and a very lean budget, we used these worksheets to save every dime we possible could and grow our savings account as fast as we could. In the end, we were able to buy our first house and pay with cash. All because of a few pieces of paper. … I knew they would work for everyone. 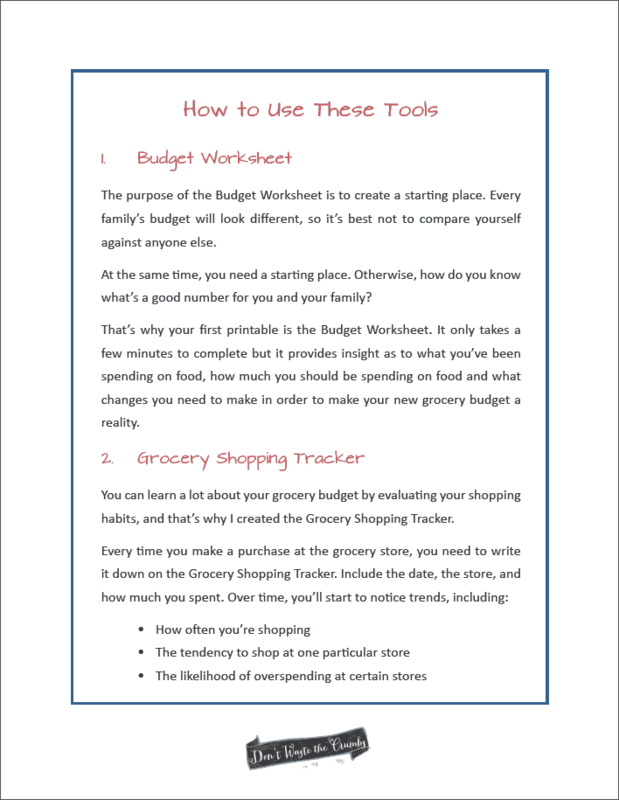 Simple and straight-forward, My Grocery Budget Toolkit comes with 7 worksheets (a total of 38 pages) and a 4-page quick start guide that shows you how to use each worksheet and how they work together. It’s everything you need – and nothing you don’t – to get your grocery budget started on the right foot. Just so we’re clear – My Grocery Budget Toolkit will not tell you to buy the things I buy or eat the way we eat. 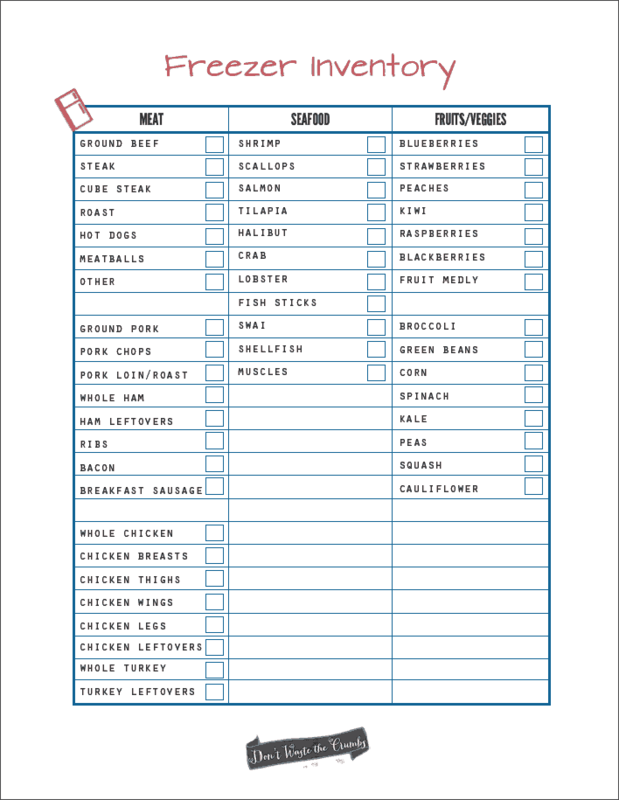 Instead these worksheets will help you figure out the best items to buy, within the foods you already eat, within a budget you set. It’s completely customizable to YOUR life, no matter where you live, how big your family is, the food restrictions you deal with or the picky eaters around your table! 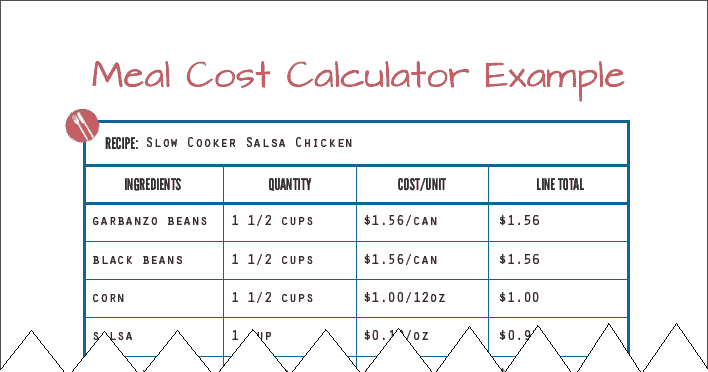 Can these worksheets save you $10,000? Honestly, I don’t know. I don’t know what your spending habits are, where you live or the types of foods your family needs to eat. But I do know this – these worksheets changed the trajectory of my life. And I know that if your goal is to save money and eat real food on a budget, they can change your life too. The information on this website has not been evaluated by the FDA and is not intended to diagnose, treat, prevent, or cure any disease. We are a participant in the Amazon Services LLC Associates Program, an affiliate advertising program designed to provide a means for us to earn fees by linking to Amazon.com and affiliated sites. Click HERE if you're a brand looking to collaborate on a project. If you'd like to become an affiliate, learn more HERE.